It was a very hard fought game in tough conditions. The rain had left Glenury Park extremely soft underfoot but both teams still got the ball down and played some great football in a highly entertaining game. 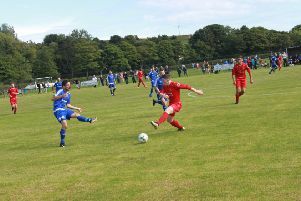 The sides met at Links Park in the Grill League Cup back in August with Roselea running out 3-1 winners. The hosts were without the injured Ryan Fenby, Rthys Gray, Alan Lloyd, Craig Lowden, Adam McLennan and Clark Robertson while Ryan Begg missed out through holiday and Kade McCormack was ineligible. The pitch was very wet after the rain through the week and was passed fit to play by the match referee. Although it made conditions tricky for both sets of players the biggest loser would be the Stonehaven groundsman who would have the unenviable job of repairing the surface in the coming weeks. 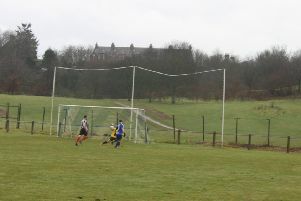 Stonehaven started brightly with two early chances. Stephen did well to block a shot from Trialist with a sliding block in three minutes. Roselea almost took the lead in 12 minutes when Hester had a hook shot and McIntosh saved well when he clawed the ball away from the post. He was further frustrated when he received a booking for smacking the ball off the corner flag after receiving some close attention from a Stonehaven defender. Walker then went close when a Hester backheel put him in but a great tackle from Kidd prevented a certain goal in 21 minutes as Roselea started to take control. Hester had a great chance in 25 minutes but scooped over after some great play from Roselea. Hester then cut in from the left and hit a vicious left-footed shot which McIntosh did well to hold at the second opportunity. It was 0-0 at the interval but Hester was coming into the game more and hit a stinger of a shot which McIntosh did well to turn around the post on the hour mark. Stonehaven took the lead after 63 minutes in unusual circumstances. A Rob Armstrong corner came in at the near post and deceived both Thomson on the post and keeper McLeod, who couldn’t prevent it going in. Roselea started to pile on the pressure and Hester and Collier went close. They got the equaliser in 83 minutes when sub Archer headed in a Thomson corner, with Cormack of Stonehaven doing his best to keep it out with his hand. He was shown a yellow card after the goal. The Hive who almost went ahead again twice when the dangerous Coyle had two great chances to put them in front. McLeod had an excellent save from a one on one. Back at the other end Hester hit the side netting when he should have done better and he was a constant threat. It was a much improved performance from the Hive which they hope to build on this week away to Hall Russell United, again in the McBookie.com Superleague (1.30pm). Stonehaven: McIntosh, Cormack, Kidd, Thomson, Robertson, Metelski, Morrice, Johnston, Coyle (Michie 90), Trialist, Armstrong. Subs not used: Beattie, Low, Mathieson, Peters.